Keywords: Chalcones, Antimicrobial, Diazenyl, Antioxidant, Diazenyl chalcones, CHNS/O. Keywords:Chalcones, Antimicrobial, Diazenyl, Antioxidant, Diazenyl chalcones, CHNS/O. Abstract:A series of diazenyl chalcones was prepared by base catalyzed Claisen-Schmidt condensation of synthesized hydroxy substituted acetophenone azo dye with various substituted aromatic/ heteroaromatic aldehydes. The structural conformation of synthesized chalcones was done by a number of physicochemical and spectral means like FTIR, UV-visible, mass, NMR spectroscopy and CHNS/O analysis. These diazenyl chalcones were assessed for their in vitro antimicrobial potential against several Gram-negative, Gram-positive bacterial and fungal strains by serial tube dilution method. The fluconazole and cefadroxil were used as standard drugs. The target compounds were also evaluated for their antioxidant potential by DPPH assay. 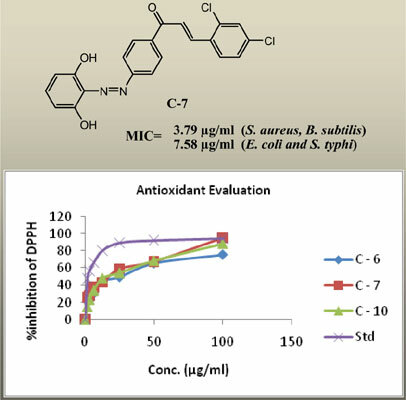 (2E)-3-(2,4-Dichlorophenyl)-1-(4-((2,6- dihydroxyphenyl)diazenyl)phenyl)prop-2-en-1-one (C-7) had shown very good antimicrobial potential with MIC ranges from 3.79 to 15.76 μg/ml against most of the tested microorganisms. Most of the synthesized diazenyl chalcones were found to be active against B. subtilis. The (2E)-1-(5-((2-Chloro- 4-nitrophenyl)diazenyl)-2-hydroxyphenyl)-3-(2-hydroxynaphthalen-1-yl)prop-2-en-1-one (C-10) had shown high free radical-scavenging activity when compared with the ascorbic acid as the reference antioxidant.